A significant advantage in using Common Core State Standards is that they are general, with broader curriculum application. They can potentially lead to higher-level thinking and mastery of 21st century skills rather than focus on lower-level test-prep answers. 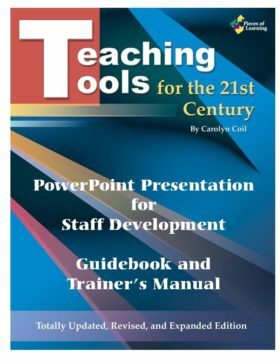 Coil’s practical examples show educators how to use differentiated curriculum, differentiated instruction, and differentiated assessment with the Common Core State Standards. 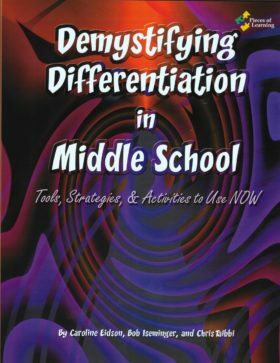 Differentiation is essential when educators work with diverse groups of students while using the same set of Common Core State Standards for each student. These activities and corresponding assessments are specifically designed examples of how the CCSS can be implemented in your classroom with diverse students. Differentiated curriculum calls for differentiated assessment. Not only are the topic activities differentiated and provide for student choice, but the assessments are differentiated as well. Using differentiated activities and assessments leads to greater success and achievement on high-stakes standardized tests. Coil includes over 50 topics in language arts, math, social studies, science, and interdisciplinary topics. Lesson formats include Curriculum Compacting, Individual Lesson Plans (ILP™), Questivities™, Tic-Tac-Toes, and Tiered Lessons & Units. The accompanying CD includes all 50+ lesson formats (activities AND assessments) in ready-to-use customizable WORD files. As a long-time educator of twice exceptional students I found this book to be incredibly helpful. I only wish I’d had something like this when I first started teaching! It is apparent that the activities are based on best-practices research. This is a book I would recommend to any teacher – whether you are just beginning to teach or whether you have taught for many years. 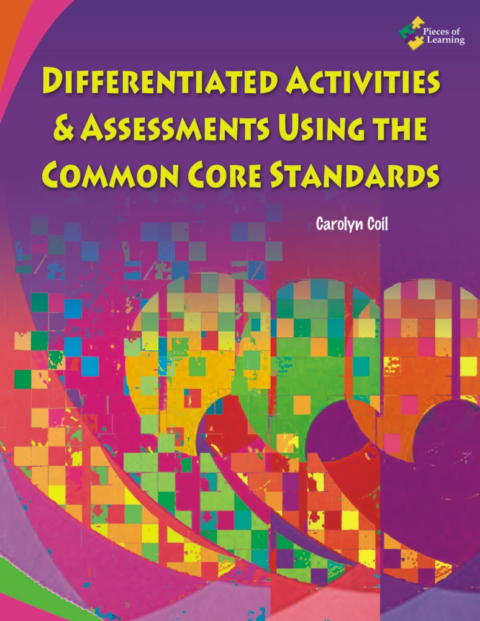 Differentiated Activities and Assessments using the Common Core is a must have book for all teachers. 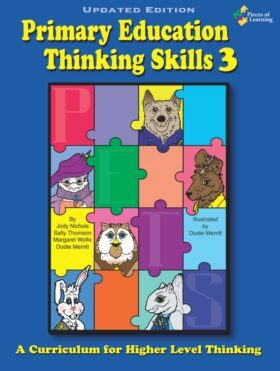 It gives wonderful examples of a variety of lesson plans and strategies to keep your gifted learners engaged in your classroom. It makes planning quick and easy with lesson plan templates available on the included disc. It is also extremely relevant since it shares ways to use the common core standards. This book is full of activities to use in any classroom. Teachers all know what a range of ability levels you can have in your classroom. With the ideas presented, you’ll find a way to reach all of the students. 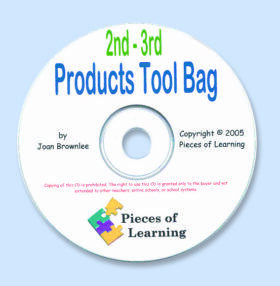 Some pluses are: ready-to-use activities, examples of the activities, and a disc with templates waiting for your ideas. With the common core standards upon us, I know it will be helpful for me! I would recommend Differentiated Activities and Assessments using the Common Core to all teachers. The examples are wonderful and have been very helpful in lesson planning. These activities keep both gifted and the regular education student engaged while proving them with a sense of ownership as they get to choose the activities they want to do. This book is very relevant for the direction we are moving in toward Common Core Standards. Ideas are plentiful for engaging your gifted learners. The book provides a CD which makes it so easy to individualize the ideas included to suit your class. Great resource to have on your shelf! This is one of the best classroom resources I have ever used. The activities are practical as well as very adaptable for many learning styles. I like the ease with which I can access the activities as well as the assessments that go with the lessons. This is a book that I keep VERY handy and will return to often! As a teacher of young children, I found this book to be extremely helpful in my classroom. 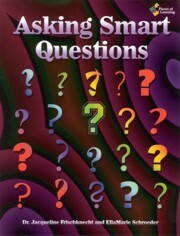 With specific activities and resources, this books took the guess work out of differentiation. Also, the convenient CD in the back of the book allows you to manipulate resources to make them work for you. Highly recommended ! I have found Carolyn Coil’s book, Differentiated Activities & Assessments Using the Common Core Standards, to be one of the most useful resources for my third grade classroom. I discovered Tic-Tac-Toe Learning Activities and my students love them. I have also begun applying the curriculum compacting ideas to my classes. Questivities is a type of lesson format that I am very excited to try. 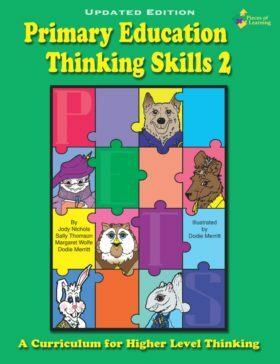 This book also provides differentiated activity connections to Language Arts, Social Studies, Math, and Science. My students will be delighted that I have become familiar with this book as they will now have more choices and more fun as a result of the lessons I have learned to create using the ideas put forth here! Thank you Carolyn Coil! The materials in this book are well organized and ready to be implemented. The samples gave me insight on what I could use with the other activites for my students. Also, like all of the other great Pieces of Learning books, a CD has been provided with this one as well. This is a book I would definitely recommend to all teachers. 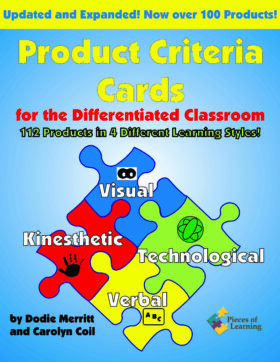 This book is an awesome tool to have on hand in every classroom, no matter the grade level. It helped me find new ways to engage my gifted learners and not leave any of my students behind. It is so important to differentiate in today’s classrooms and this book makes doing so very simple. 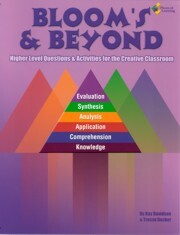 I am using this book in my heterogeneous classroom which has a large number of gifted students. It is a wonderful resource packed full of items that are ready to be used. The CD which is included has reproducibles in Word format so they can be altered to fit your needs. The book is rich with ideas and a wealth of knowledge. This book is every teacher’s dream. It comes with a CD that provides reproducibles. Half the work is done! I enjoy using the TIC TAC TOE boards in all subjects. Questivities are mini projects that are fun for students. 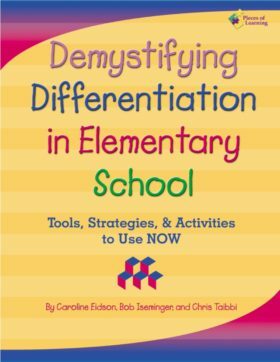 If you are looking for differentiation, you’ve selected the right book.